Who Is The New Celebrity Apprentice? Donald Trump has just named his new celebrity apprentice during the NBC’s show finale on Sunday. 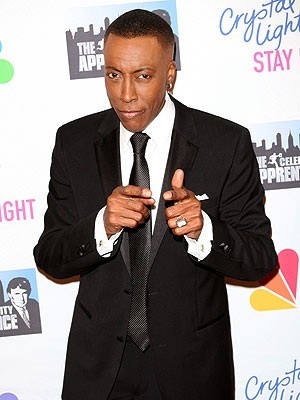 According to Us Weekly, the final battle was between Arsenio Hall and Clay Aiken, but Arsenio proved to be better at raising money for the Magic Johnson Foundation and was crowned the winner of the season. The two contestants had a very important task to prepare for the Sunday finale. They were asked to stage a variety show for charitable reasons, as well as to produce tickets and to sell them. Clay Aiken raised $301,500, whereas Arsenio Hall gathered $167,100 due to the donations he got from celebrities like Jay Leno, Chris Rock, Eddie Murphy and Jimmy Kimmel. In the end, Donald Trump hired Hall even though he raised less money. The business man justified his decision by saying that Hall deserved to win because he “worked hard and he did a great job”. Teresa Giudice and Aubrey O’Day were some of the people who helped Hall and Aiken stage their variety show for Donald Trump and his guests. Aiken would have liked to become the winner of “Celebrity Apprentice” because he did not want his mother to get disappointed again after seeing him lose the “American Idol”. He described the final challenge as an important exam where both he and his opponent excelled at. Hall’s speech, however, was just as desperate as Aiken’s. He told the press that he has always been number 2 at all the contests he took part in. Arsenio then, explained that he used to be number 2 when he was competing against Johnny Carson in TV ratings and also when he entered a magic contest during his childhood. He concluded that he deserves to win the competition in order to regain his self-esteem. As soon as he was named this season’s “Celebrity Apprentice”, Hall declared that he can’t wait to give the $250,000 check to the Magic Johnson Foundation. The TV host was very happy to contribute to the cause of the foundation as his cousin recently passed away of AIDS. At the end of the show, Hall wanted to thank singer Aiken for the “fierce competition” and friendship he provided throughout the series.